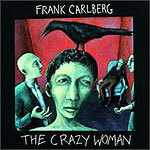 CD review: "The Crazy Woman"
This review first appeared in the January 31, 1997 issue of the North County Times. Ever get in one of those moods? You know the kind  where you just have to hear Jack Kerouac set to Finnish jazz? Really? Well, then you are in luck. Frank Carlberg has just what you're looking for: "The Crazy Woman" isn't just Kerouac, though: There are equally cheering poems by Anselm Hollo, Anna Akhmatova and Gwendolyn Brooks, among others. But if you need Kerouac atop Scandinavian jazz, you'll find two of his poems so treated: "I Clearly Saw" and "LIfe Is Sick." Still, Kerouac is relentlessly cheerful compared to some of the other verse here  "The Last Toast" by Akhmatova is enough to send even a committed optimist like Leo Buscaglia on a serious drinking binge. Despite the giddy lyrics, this is still a heck of a listenable avant-garde jazz album. Carlberg is an ace of a pianist, Chris Cheek is a phenom on saxophone, and the rhythm section swings like crazy. And singer Christine Correa has a haunting voice that breathes presence into the lyrics, making the vocal passages the equal of the instrumental solos.